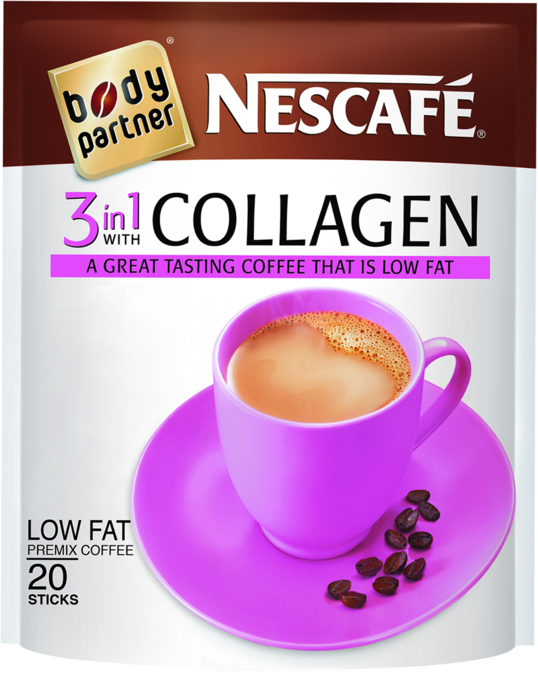 The ‘Body Partner’ range from Nescafe now offers Nescafe 3in1 collagen coffee. The anti-aging drink includes 200 mg of collagen. This drink is part of the health and wellness instant coffee products available only in Asia (Malaysia and Singapore, to be exact). Collagen is a protein in connective tissues found in skin, bones and muscles. Collagen is an anti-ageing protein. It improves the skin's elasticity and suppleness, reducing lines and wrinkles. Collagen results in firmer skin and even more tone to the skin. Collagen helps to achieve more glowing radiant and more youthful complexion. Collagen can help to lose weight and remove the reducing body fat. Collagen can help to metabolise the fat in our body, by increasing renewal and repair activities, it decreases body fat.